Smizmar by Supernatural Lacquer will be releasing for pre-order Friday, February 9th at 9pm EST. Pre-order ends on Sunday, February 11th at 9pm EST. Each full-size 15mL bottle retails for $9. Remember to use coupon code MM10 and receive 10% off your purchase! 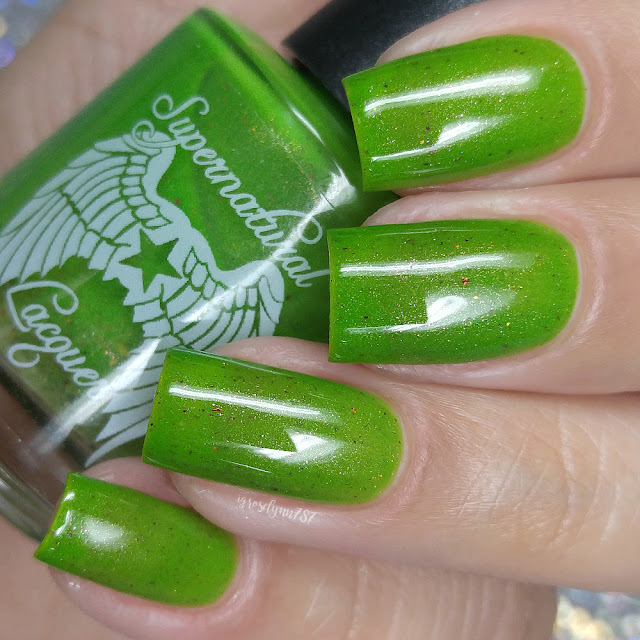 Smizmar can be described as a lime green crelly with burgundy/gold ultra-chrome flakies, red-orange-gold color shift flakies and red-gold shifting shimmer. 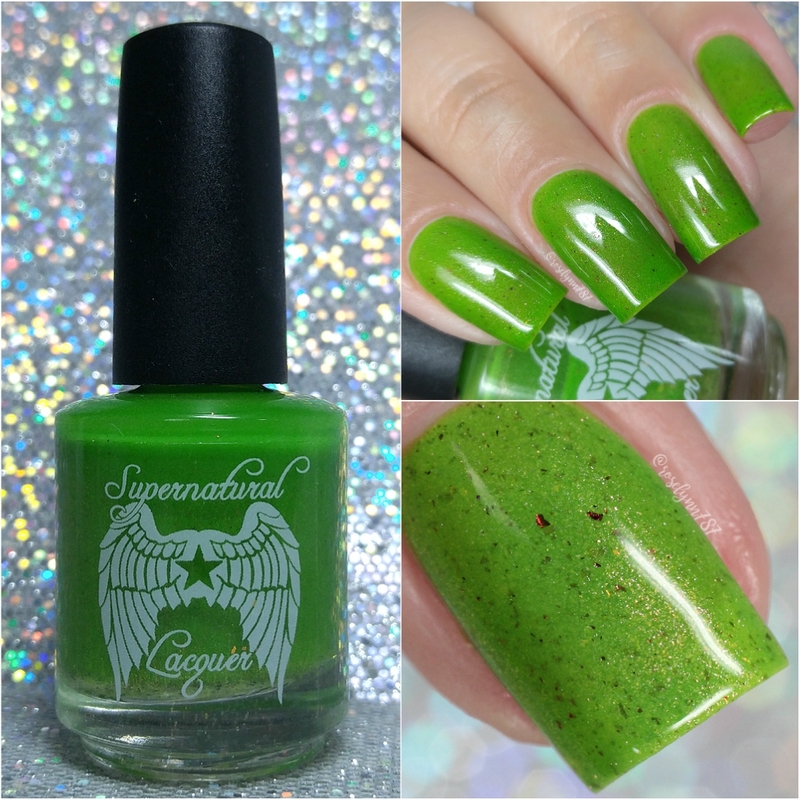 The shade is inspired by one of my favorite couples Amy and Kif from Futurama. For me 2017 felt like the year that orange won me over and this year is all about the green. I'm not complaining though! My helmers could use a little more variety, haha. I love how vibrant and bright this color is without venturing into neon territory. The flakies add such a nice touch without overwhelming the nail, it really lets the shimmer be front in center. I was also pleasantly surprised by how well this looks against my skin-tone, it's a big plus in my book. The formula has a sheer application that builds-up evenly for full coverage. It has jelly-ish feel while still managing to look creamy and smooth. Consistency wise it's well balanced and isn't not too thick or too thin. I did notice the larger flakies are on the scarce side, but it's not something I personally minded. Especially because the smaller sized flakies fill in the spaces quite nicely. It dries down to a smooth high-shine finish on its own. I did experience some minor staining on removal to my nail beds, but not on my cuticles. Shown in three coats and sealed with a glossy topcoat. 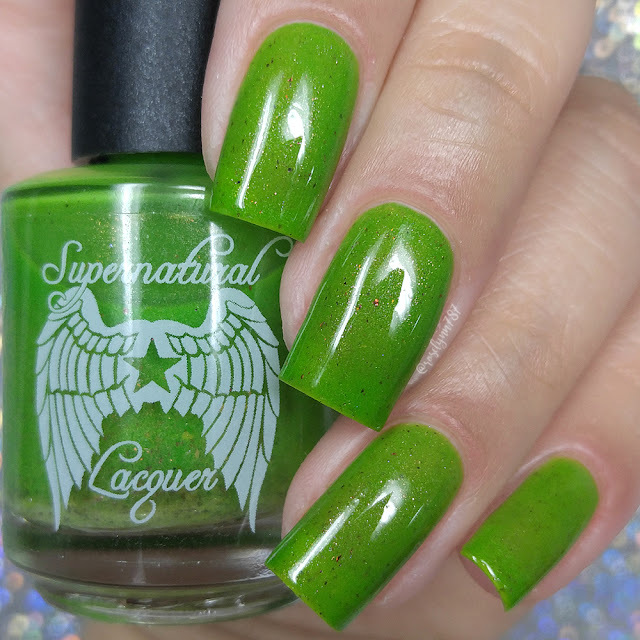 To recap, Smizmar by Supernatural Lacquer will be releasing for pre-order Friday, February 9th at 9pm EST. Pre-order ends on Sunday, February 11th at 9pm EST. Each full-size 15mL bottle retails for $9. Remember to use coupon code MM10 and receive 10% off your purchase!